Renowned sculptor and African roots music maestro, Bryn ‘Sekurutau’ Mteki has won a rare opportunity to collaborate with Chimurenga music legend, Dr Thomas ‘Mukanya’ Mapfumo on his new song following their meeting yesterday. Mukanya appears to be the most sought after musician for collaboration as local artists are scrambling to have a dance with him in the studio before he retreats back to his base in the United States of America. Last night, Mteki paid a visit to Mukanya where they talked of coming up with a music piece together before showering the ‘Nyoka Musango’ hit-maker with food products from his Brybrands supermarkets around the country. “Monodya masvika kumhiri uko, hakuna dovi rakaita seredu kairi uko,” said Mteki as he handed over Brynbrands’ ‘Mvura’ purified water and peanut butter to the legendary Chimurenga music singer. Mteki lamented the drowning ‘Mbira’ music genre, expressing hope that Mukanya’s visit will help resurrect this unique art of music. “Mbira dzedu dzakufa Mukanya, tinofara nekuuya kwamaita nekuti muchadzimutsa,” said Mteki. Though many artists are hunting for a collaboration with Mukanya, his short stay and tight schedules may prove a stumbling block to the countless overtures made to him. Mukanya has already confirmed collaborations with Sulumani Chimbetu and Sekurutau. “On local collaborations I’ll have one with Sulumani Chimbetu and with my friend here (Mteki), we have a lot to do and talk about” said Mapfumo. 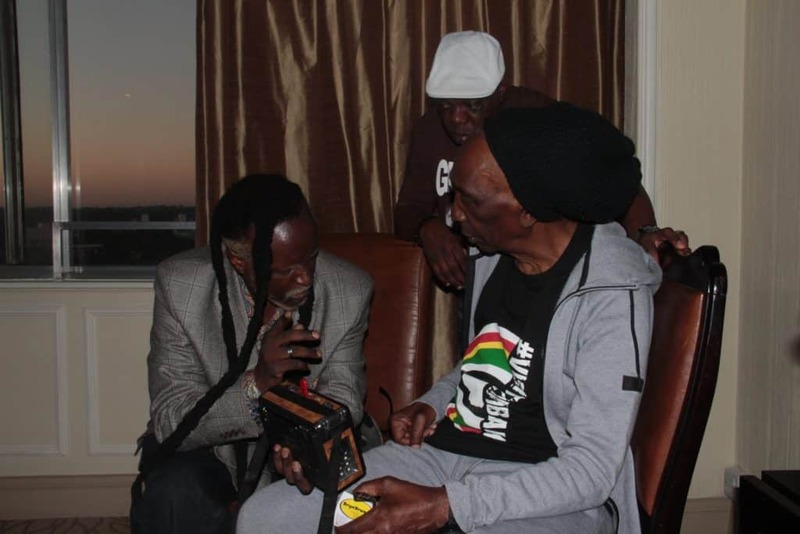 Meanwhile Mapfumo is set to leave the country on Monday after his much expected Bira set for 28 April at Glamis Arena in Harare.